Ask anyone to name the person who discovered the scientific theory of natural selection, as published in The Origin of Species, and the chances are that they will answer ‘Charles Darwin’. But there was another Victorian scientist who, quite independently, discovered the theory of evolution by natural selection at the same time as Darwin – his name was Alfred Russel Wallace. At the time, the end of the 19th century, he was acclaimed for his achievements and was recognized as a world expert on the flora and fauna of Malaysia and Indonesia, but since then he has been largely forgotten, unlike his more famous fellow naturalist Charles Darwin. 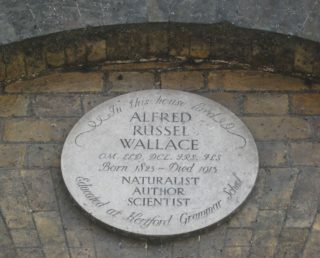 However, Alfred Russel Wallace is still remembered in Hertford because this is where he lived for several years during his early childhood and it was here that he first developed his interest in the natural world. Alfred’s father was Thomas Vere Wallace, born in 1771, probably in Hanworth, Middlesex, but of Scottish descent. 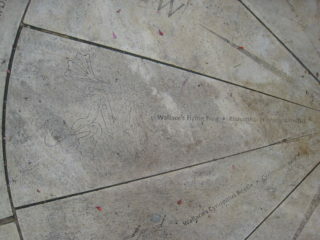 His mother was Mary Anne Greenell, who was the second daughter of John Greenell of Hertford. The Greenells were a well-known, respected Hertford family and had lived in the area for generations – Alfred’s great-grandfather on his mother’s side had been an alderman of the borough and Mayor of Hertford twice, in 1773 and 1779. Thomas and Mary married in 1807 and initially lived in Marylebone, London, before moving to Southwark, London, in 1816 and then to Usk in Monmouthshire. It was here that Alfred was born, on 8 January 1823. He was one of nine children – five girls and four boys – but three of his sisters died before they were 10 years old and another one, Eliza, died of tuberculosis in Hertford at the age of 22. His three brothers were called William, John and Herbert. In 1828, no doubt because of the family connection with the town, the Wallaces moved to Hertford, living here for nine years until 1837. 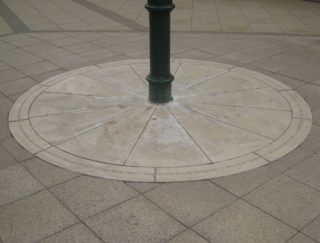 On arrival they lived in St Andrew Street, in the building now known as Wallace House (currently a doctors’ surgery), identified by the circular stone plaque above a ground-floor window recording this fact (see photo below). Almost straightaway Alfred met a boy of about his own age, George Silk, who lived next door, and they struck up an immediate and life-long friendship. Two years later, in 1830, the family moved to a house at Old Cross (currently No. 23, now partially occupied by The Classic Barber), which had a south-facing gable end where a grapevine grew. This provided a plentiful supply of grapes for the family from which Alfred’s father made wine. He also made beer, in the brewhouse at the back of the house, and grew fruit and vegetables in a small garden that he hired about half a mile from the house. The period spent in this house was a particularly happy time for the young Alfred and it was here that he first learned about the common English garden flowers – there was a small garden at the back of the house. He also very much enjoyed playing with his brother John in a stable loft behind the house, where they spent many hours indulging in typical boyish pursuits, such as making their own toys (the Boys’ Own Book proving an invaluable guide) and using gunpowder to make fireworks! In the same year that the family moved to the Old Cross house Alfred, now aged 7, attended Hertford Grammar School (which later became Richard Hale School), then situated in a building in Churchfields near All Saints’ Church, where his brother John was already a pupil. The original red-brick building can still be seen, although it is partially hidden by the wall along the south side of Gascoyne Way. 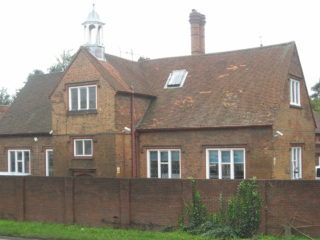 It currently houses the Rivers Education Support Centre. 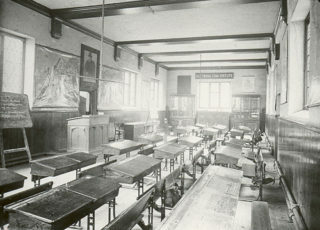 At the time that Alfred attended the school all the teaching was done in a single long room. The school day started at 7 a.m. and on three days of the week continued until 5 p.m. During the winter months lighting was provided by the candles that each boy was required to bring with him. There were about 80 boys and four teachers, including the headmaster, Clement Henry Crutwell, whom Alfred described as ‘a rather irascible little man’ (nicknamed Old Cruttle or Old Clemmy by the boys!). Among the subjects that Alfred studied were Latin, geography and history, but he found the approach to learning by memorizing facts and figures frustrating and tedious. He did, however, read extensively, both at home and in the local library where his father worked for a while. In his last year at the school he assisted in teaching the younger boys, probably in lieu of his school fees. 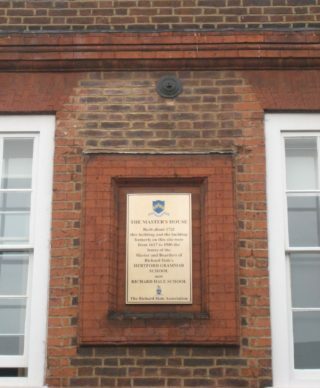 Alfred’s time at Hertford Grammar School provided all the formal education that he received. Alfred’s parents were traditionally religious (members of the Church of England) and as a result the whole family generally attended church twice each Sunday – most likely at St Andrew’s, although they occasionally attended the Friends’ Meeting House in Railway Street as they knew a number of Quakers in the town. When Alfred’s father died in April 1843 he was buried in St Andrew’s churchyard. The Wallace family had always struggled financially, mainly because Alfred’s father, Thomas, despite having qualified in the law, never had a regular occupation. 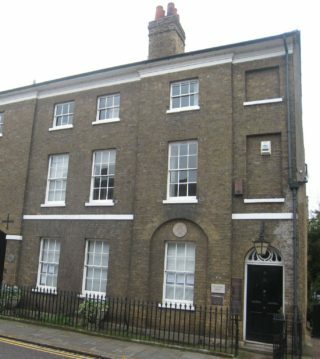 Further financial problems necessitated a move from the Old Cross house in 1834/1835 to part of a house near All Saints’ Church (where St John’s Hall is now). However, the accommodation wasn’t big enough for the whole family and as a result Alfred moved out to spend about six months as a boarder in Mr Crutwell’s house along with 20 or 30 other boys. 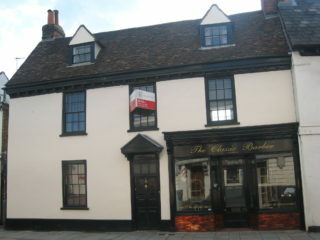 This is the building known as The Master’s House in Fore Street, Hertford. It wasn’t long before his parents moved again, to part of another house in St Andrew Street near St Andrew’s Church (the building now occupied by Ruby restaurant), living there for a short time from mid 1836 to early 1837 when they eventually left Hertford and moved to Hoddesden. At that point Alfred, having left school in December 1836, just before his 14th birthday, moved to London to join his brother John, who was living there and working as an apprentice to a carpenter. After some months in London Alfred went to join his eldest brother William, then in Bedfordshire, in order to learn land surveying, a profession that he enjoyed because it enabled him to spend some of his working time outdoors where he could develop his interest in nature. At the end of 1837 he briefly returned to Hertfordshire for a holiday, staying with his parents who were then living in Hoddesdon – he walked the whole way, a distance of some 30 miles via Hitchin and Stevenage, breaking the two-day journey overnight at a local pub. Some years later, during a period when surveying work was rather scarce, Alfred filled his time by studying the wild flowering plants of the Glamorgan area to which the brothers had moved in 1841, spending his days out gathering specimens which he then pressed and made into a collection. He also started learning about the classification of plants during this time. When the surveying work dried up altogether he moved to Leicester to take up a teaching post and it was while here that he read travel books about foreign countries and met Henry Walter Bates, an entomologist with a particular interest in beetles. This led Alfred to develop an interest in this subject too, as well as plant life, which in due course was to inspire the foreign travels and fascination with these subjects that eventually became the main purpose of his life – the study of the origin of species. Alfred’s first overseas expedition to research and study insect life, initially accompanied by his friend Henry Walter Bates, was to northern Brazil in 1848, then a little-known and uncharted part of the world. He spent four years in the country, exploring it thoroughly and making several adventurous, and no doubt very hazardous, river trips in his quest to study insects, trees, plants, birds and butterflies. He also enjoyed meeting and living among the various local people of the areas he visited. Disaster struck on the return voyage to England, however, when the ship caught fire and all aboard had to take to small boats for about ten days until they were eventually rescued by another ship – but the vast majority of Alfred’s research and all of his collections gathered over the previous four years were destroyed in the fire. After 18 months or so back in London and having recovered from this dreadful experience, he resumed his travels – to Singapore, Borneo, and the smaller islands of the Malayan Archipelago – for a total of eight years, during which time he accumulated an enormous collection of specimens. It was also during this period that he developed his theories about natural selection and the origin of species, eventually, in 1858, reaching the same conclusion – but quite independently – as Charles Darwin. Four years after his return to England, in 1866, Alfred married 18-year-old Annie Mitten, the daughter of his botanist friend, William Mitten. They had three children but only two, Violet and William, survived into adulthood. These descriptions suggest that Alfred, even at such a young age, already appreciated and enjoyed the natural world and one can imagine that he spent many happy hours playing on Hartham Common, exploring The Warren, and splashing around in the River Beane – just like children today. 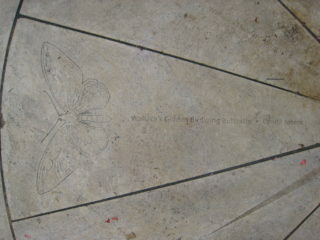 The roundel also features eight species of animals that were discovered by Wallace: Wallace’s Cyriopalus Beetle (Cyriopalus wallacei); Wallace’s Flying Frog (Rhacophorus nigropalmatus); Resplendent Jewel Beetle (Chrysochroa wallacei); Striped Possum (Dactylopsila trivirgata); Wallace’s Giant Bee (Megachile pluto); Altum Angelfish (Pterophyllum altum); Wallace’s Golden Birdwing Butterfly (Ornithoptera croesus); and Wallace’s Standard-Wing [Bird of Paradise] (Semioptera wallacei). Alfred Russel Wallace died on 7 November 1913 and the centenary of his death was marked by a major exhibition entitled ‘The World of Wallace’ at Hertford Museum in Bull Plain which ran from October 2013 to the following February. 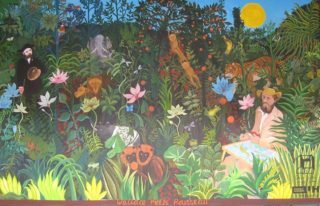 A colourful mural with references to Wallace’s work, entitled Wallace Meets Rousseau has been created by users of Courtyard Arts in the style of Rousseau and can now be seen on the wall to the left of the entrance to Waitrose in Bircherley Green. 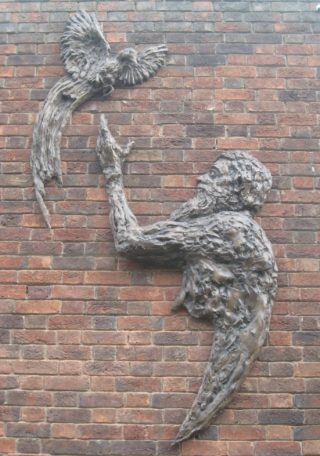 A wall-mounted sculpture of the great man has been installed on the riverside exterior of Hertford Theatre. It was created in bronze resin by sculptor Rodney Munday, from Much Hadham, and unveiled in October 2014. Another new sculpture, by local artists Leiselle Bristow and Karen Murphy, is situated near Sainsbury’s on the edge of Hartham Common. 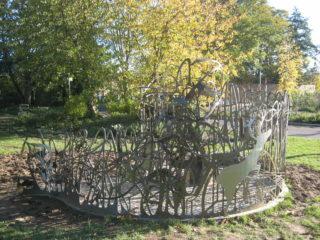 Entitled ‘Evolution’, the sculpture highlights different aspects of Hertford’s past, but the initial concept was inspired by Alfred Russel Wallace – look out for Wallace’s Flying Frog, which features in the design. 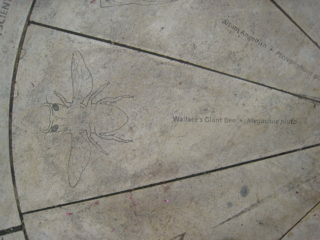 Internationally, the anniversary was celebrated by a series of events under the collective heading ‘Wallace100’. Finally, it seems, this modest, unsung hero – ‘the forgotten naturalist’ who spent his formative years in Hertford and whose legacy has been overshadowed by Darwin’s for too long – is being accorded the worldwide recognition that he deserves as the co-founder of the theory of evolution. Fascinating! A footnote on Mr Crutwell and the Richard Hale School: Records held at H.A.L.S. indicate that by 1857 the Government Inspector was very critical of the school building (not in a good state of repair and certainly in need of Paint and Whitewash) and the standard of education. In his view, Mr Crutwell had grown old (he declined to give his age but seemed to be about 70) and old fashioned. (Mr Crutwell was 62 at the time). However, he was well regarded by parents – many of whom were former pupils. (H.A.L.S. D/Ehx/Q3).